We are very fortunate to have an interview with Matisse (keys) from Keys N Krates this week! Here is Bryen's interview with Matisse! Bryen: It was almost two years ago now that I first heard about Keys N Krates. What was the process of getting that started? There are tons of people try to work in live instruments with a DJ mixing and to be honest, a lot of them don't do too well. You guys have a great handle on it. Matisse: Our DJ, Jr. Flo, was doing his own thing at the time and I was doing my own thing with other musicians. We met through a mutual friend and you know, he mentioned that he wanted to work with live musicians and I mentioned to my friend that I wanted to work with DJ. So you know, it kinda started from there. I called up our drummer, Adam Tune – we’ve been playing together for around ten years- he was into it. So we locked ourselves in a rehearsal studio for six months. We were just trying to figure out how to communicate with each other; cuz really it was a little bit of a difficult thing at the beginning - just figuring out how we were gonna make this thing actually work with remixes. We spent a lot of time making sure we were working with the right samples and making sure that the energy for each track really fit. A lot of people have a hard time seeing us as a band – but we are still a band. The DJ and sampling, it’s just another music instrument that is a part of the band. It’s no different than a horn player is in a band or a flute player or something else. Those are the three instruments that we have in our band. We have a DJ and keyboardist and drummer. We play together all the time and I think that a lot of it too makes it more of a band. Bryen: Rather than just a DJ and some guys hanging out, it does feel like a band. It certainly sounds like it, too. Matisse: Yeah, you know it's definitely a band and we are on the road all the time so obviously we got certain sounds and certain feeling all together. So that's probably what makes us as a band. Bryen: How often do you guys play in a year? Matisse: Yeah right now, it's probably like 150 shows last year or something close to that. We play as much as we can. Bryen: Yeah, of course well, it helps to keep everything out there because everything has to stay current. Bryen: Within that initial six month period, what was it that you were working on most? Matisse: Well, it was more of how we were gonna structure songs. We didn't really have verses or choruses. So it was like "I am gonna do this right here for 8 bars” – things like that. It was more like finding out how we were gonna make something work without the vocal. – How we would make it interesting enough for people to dance to with only these three instruments. We kinda went like that. We didn’t know exactly what we were doing, because we didn't really have a template when we started or any other bands to look to for inspiration. We didn't really know and had to pick it up at the beginning. It was a lot of pains and there were a lot of yelling and screaming a couple of times hahaha. Matisse: Yeah but you know, but we are definitely better for it. Bryen: How does the work with three guys? Is there a leader in the band? Matisse: Well, we all have certain roles that we all kinda do our own. But when we all come up with a song, its kinda of like we all have to like to it to begin with or live with it. If anyone hates a song or hates a part we don’t use it. Same with the samples. And we do usually start off with a sample. We’ll then try to build off of that to see what works. It’s the exact same if a guitar player came in with a riff. We build it to make a song. We kinda look at sample like it’s just a beginning. It’s like a the spark to our ideas. Bryen: After the six months period, how soon that was that you guys were out playing shows? Matisse: Six months from the rehearsal to the first show – almost to the date. And once we started doing shows, we haven't stopped since. Bryen: I was gonna say non stop since then. Yeah I hear about you guys do lots of shows. Matisse: Yeah it's funny that some of our first shows like very early stuff like a remix of Snoop Dogg’s, stuff like that. All these videos on our YouTube are taking from our very, very, very first show that we did. Matisse: That was kinda how we got our name out there because of the show and we still do because the remix of it is kinda you know went through how the YouTube universe. That’s how we got our attention. The last half of the interview will be coming up shortly. 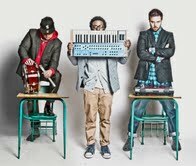 Stay tuned... Also “Keys N Krates plays Lee’s Palace on Thursday December 9th”. Chekc out the link below to get to know more about the Trio, too! Great! it is actually coming out on the weekend :) stay tuned!